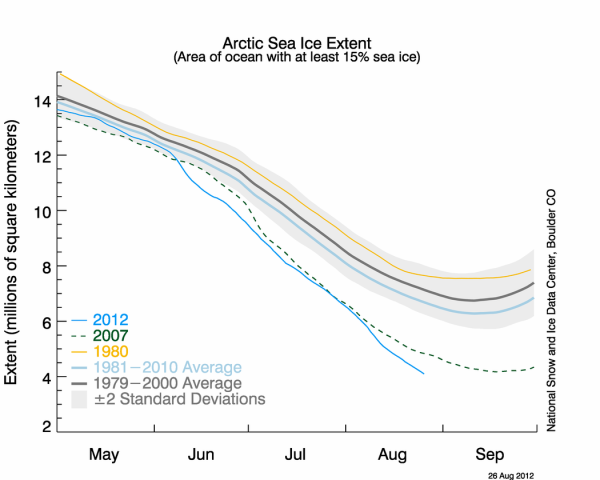 The amount of sea ice in the Arctic has fallen to the lowest level on record. On August 27, Arctic sea ice was at 4.10 million square kilometers (1.58 million square miles), or about 30 % of the Arctic Ocean’s surface according to the National Snow and Ice Data Center (NSIDC) and NASA. This was 70,000 square kilometers (27,000 square miles) below the September 18, 2007 daily extent of 4.17 million square kilometers (1.61 million square miles). The amount of sea ice in the summer has declined more than 40 percent since satellite tracking began in the late 1970s. Computer modeling have long suggested that the Arctic could be completely free of ice by the middle of the century, but latest data indicate more pessimistic analyses that it may come much sooner, perhaps by the end of this decade. However, there is only a 33-year record of careful satellite observations. 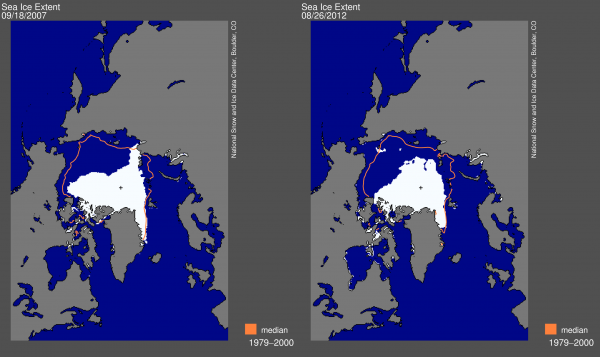 Arctic sea ice reached previous record lows in 2002, 2005, and 2007. 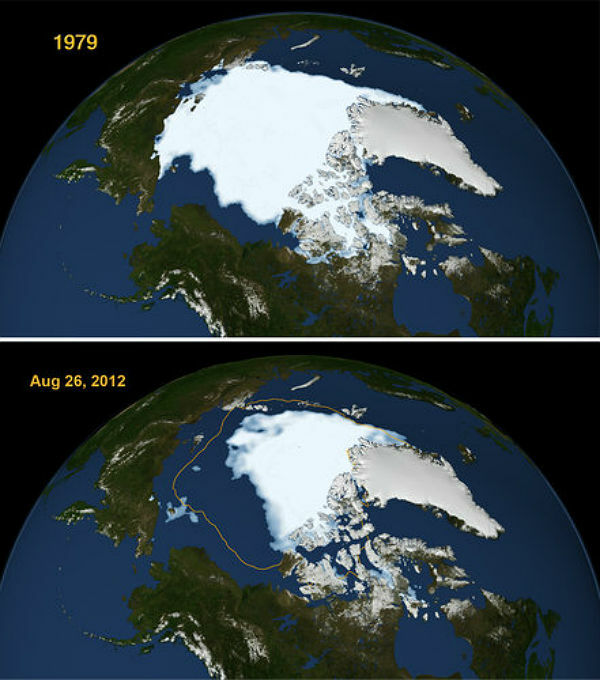 Periods of intense ice loss in June and August 2012 pushed Arctic sea ice below the previous record from 2007. High pressure over the Beaufort Sea and low pressure over northeastern Eurasia pulled in warm winds, which melted the ice and pushed it away from the Siberian and Alaskan coastlines in 2007. These pressure patterns also occurred in 2012. Sea ice melt rates still reached up to 150,000 square kilometers (57,900 square miles) per day in 2012, more that twice the long-term rate. In July 2012 saw widespread melt on the Greenland Ice Sheet and the calving of a new iceberg from Greenland’s Petermann Glacier. By early August, rapid sea ice retreat left the Northwest Passage nearly open, although ice moved back into parts of the passage later in the month. Arctic sea ice usually reaches its lowest annual extent in September, and considering the situation in August, it is likely that the amount of ice cover may continue to shrink. NSIDC will release a full analysis of the melt season in early October, once monthly data are available for September. The warming trend has reduced the ice to just a shell in many places. A powerful storm in the Arctic this month almost certainly contributed to the record by breaking up ice. The reduction in sea ice is altering weather patterns in the Arctic region, causing rapid erosion of shorelines. The melting of sea ice does not raise global sea levels, because the floating ice is already displacing its weight in seawater. Melting of land ice does raise sea levels. Sharp warming threatens land ice, especially the Greenland ice sheet, which is melting at an increasing rate. The white surface of the ice reflects sunlight back to space, but the darker water and land exposed when the ice melts absorb more heat from the sun (which leads to more melting and more sunlight absorption). Scientists call it Arctic amplification. Some scientists suggest that air circulation patterns are being altered in a way that favors more extremes, like heat waves and droughts. Here is a link to the NOAA website and an interesting article from the Washington Post, November 1922. http://docs.lib.noaa.gov/rescue/mwr/050/mwr-050-11-0589a.pdf It may put things in perspective?